Although I am originally from the midwest, this year’s EXPO Chicago was my first time attending the international art fair. Having lived elsewhere for the past several years, and having visited a variety of different art fairs and festivals while doing so, I was anxious to see what EXPO had to offer. I can gladly say that it did not disappoint. Not only did the fair showcase an incredibly talented and unique roster of artists, it also featured a plethora of thought-provoking and dynamic programming, which included panel discussions on essential topics in curating, and an interview marathon hosted by world renowned curator Hans-Ulrich Obrist. Although, I was completely wowed and mesmerized by the artwork around every corner, I’ve come up with a list of galleries whose featured artwork was truly unforgettable. Here are my top ten gallery booth highlights from EXPO Chicago. And if you are able, be sure to visit these galleries in person…I know I will! Shulamit Nazarian, EXPO Chicago, 2018. Image courtesy Shulamit Nazarian, Los Angeles. 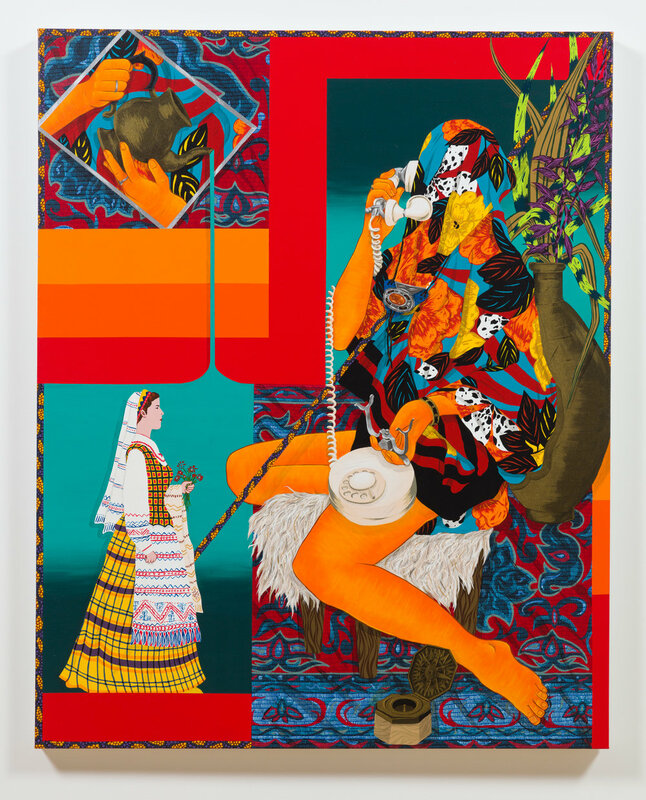 Amir H. Fallah, Calling On The Past, 2018, acrylic on canvas, 60 x 48 inches. Image courtesy the artist and Shulamit Nazarian, Los Angeles. Shulamit Nazarian gallery’s booth was an absolute showstopper. I still remember spotting this work from across the fair and making my way over to get a better look at these incredible paintings. 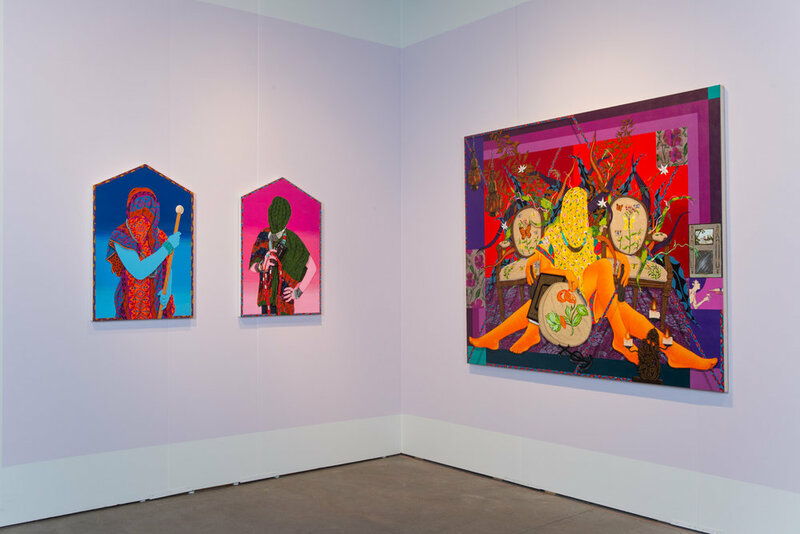 I spent so much time looking at these vivid works by Amir H. Fallah, who Shulamit Nazarian represents, and could not believe the vibrancy in the colors and the intricate patterns within each painting. Check out the gallery’s website to see more of Fallah’s work, which also includes installations. And next time you are in L.A., be sure to stop by this gallery! Christian Rex van Minnen, Let’s Step Outside, 2018, 72 x 60 inches, oil on linen. Image courtesy of Richard Heller Gallery. Installation view of Richard Heller Gallery booth at EXPO Chicago, 2018. Image courtesy of the gallery. Having been a huge fan of Christian Rex van Minnen’s work for some time now, to say I was excited to see his work in person is an understatement. His painting Let’s Step Outside is even more impressive in person. The artist’s skill and attention to detail is almost unbelievable, as his subjects look as if they are three-dimensional. The work will certainly leave you in awe, not knowing quite what you are looking at when seeing his fleshy, gummy-like creations. Other works featured at Richard Heller Gallery’s booth also caught my eye, which included the work of Amy Bennet, Ryan Travis Christian, Neil Farber, Farshad Farzankia, Kajahl, Tony Marsh, Joakim Ojanen, Alina Perez, Paco Pomet, Ryan Schneider, Devin Troy Strother, Orkideh Torabi, and Mark Whalen. Eddy Kamuanga Ilunga, Fragile 9, 2018. Acrylic and oil on canvas, 179.5x206.5 cm. Courtesy of October Gallery. Installation view of October Gallery booth at EXPO Chicago, 2018. Courtesy of the October Gallery. Installation view of Greedy Nero by Adam Parker Smith, 2018, Resin, fiberglass, urethane, steel; wood base. 30h x 30w x 16d inches. Library Street Collective booth at EXPO Chicago, 2018. Image copyright Library Street Collective. Installation view of Library Street Collective booth at EXPO Chicago, 2018. Image copyright Library Street Collective. Library Street Collective’s booth provided a breath of fresh air with a unique aesthetic straight out of of Detroit. Bright, saturated colors and neon lights contributed to a stand-out selection of artwork that filled the space with eager viewers. The pop-art-esque sculpture titled Greedy Nero by Adam Parker Smith was just one of many amazing works that was featured at EXPO Chicago as an extension of the exhibition Coping Mechanisms, hosted at their permanent space in Detroit, curated by Sara Nickleson. Installation view of Night Gallery booth at EXPO Chicago, 2018. Image courtesy of Night Gallery. Awol Erizku, “Study of the Body and Two Masks,” photography, 2018. Image courtesy of Night Gallery. One of my favorite elements of EXPO Chicago was their EXPOSURE section, which showcased solo and two-artist displays hosted by younger galleries. This provided a change of pace, allowing me to slow down and really examine a larger collection of an artist’s work, rather than just one or two pieces. In this section, Night Gallery’s display of photography by artist Awol Erizku stuck out in the crowd. The booth was a color-lovers dream, as the walls were painted the same orange featured in the photography as well as the frames. The contrast between this orange hue and the subjects of Erizku’s work was beautiful and striking. Make sure to check out this Los Angeles-based gallery in person, as they have more work available by the artist. Jonathan Chapline, Virtual Characters, Domestic Landscape III, 2018. Acrylic and flashe on panel. 47 x 60 inches, 119 x 152.5 cm. Courtesy of The Hole, NYC. Installation view of The Hole, NYC booth at EXPO Chicago 2018. Courtesy of The Hole, NYC. The Hole, NYC represents an impressive roster of artists, many of which were showcased at their booth at EXPO Chicago. Featured artists included Alex Gardner, Eric Shaw, Holton Rower, Joe Reihsen, Jonathan Chapline, Johnny Abrahams, Matthew Stone, Morgan Blair, Robert Moreland, Royal Jarmon, and Adam Parker Smith. Each piece ranged in style and content, while still managing to be incredibly cohesive without any piece becoming lost or overlooked. One particular highlight for me in this booth was the work of Jonathan Chapline, whose psychedelic colors and bold lines create unforgettable compositions. 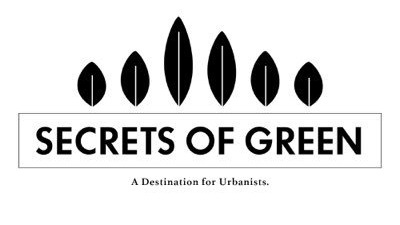 Make sure to check out The Hole next time you are in NYC, as they also host performances and other artist-centric programming. Installation view of Nancy Hoffman Gallery booth at EXPO Chicago, 2018. Image courtesy of Nancy Hoffman Gallery. At Nancy Hoffman Gallery’s booth, I found myself absorbed in the large-scale, unique paintings of Peter Plagens, which was juxtaposed with the sculptural work of Jesse Small, among others. Although the artists’ works are very different from one another, the contrast complimented both bodies of work beautifully. What added to my experience at this booth was the welcoming environment from a knowledgable staff and the additional information provided about the artists. I always enjoy a good wall text— and on the gallery’s website, they describe Peter Plagen’s paintings as “a quirky personal expression, on which his characteristic clumsy/pretty configurations comport themselves.” Learning more about the artist’s practice can really enhance your experience when viewing their work! Installation view of Galerie Division booth at EXPO Chicago, 2018. Image courtesy of Galerie Division. With locations in both Toronto and Montreal, Galerie Division showcased just about every kind of artwork you could think of, including painting, sculpture, installation, and digital animation. The digital animation titled CG Family of artist Alex Mcleod was absolutely mesmerizing, as shapes of liquid gold melted and changed form on screen, dancing and flowing. The paintings of Chloe Wise were also a stand-out within the selection of work Galerie Division featured. Installation view of Richard Gray Gallery booth at EXPO Chicago, 2018. Image courtesy of Richard Gray Gallery. Jaume Plensa, Laura Asia in White, 2017. Courtesy the artist and Richard Gray Gallery. Image by Gasull Fotografia, Plensa Studio Barcelona. 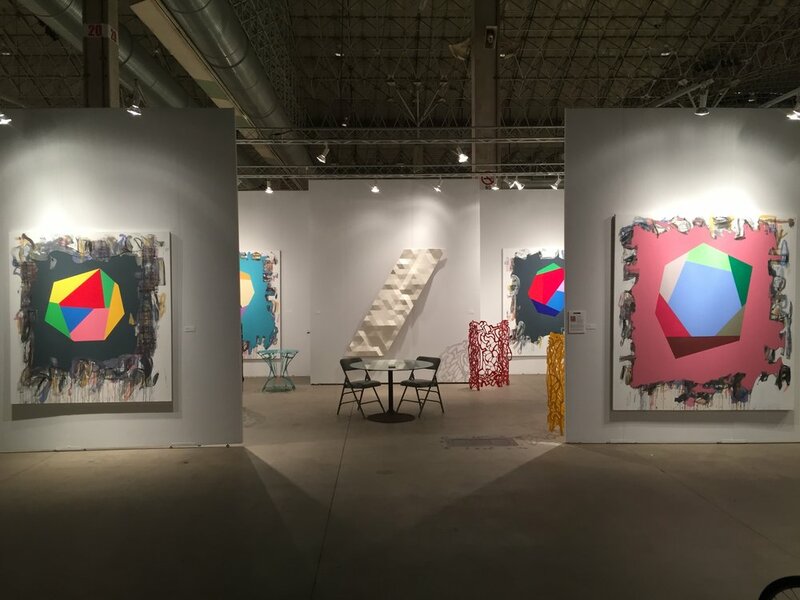 A staple in the Chicago art scene, Richard Gray Gallery showcased a staggering collection of contemporary and modern art, making it a must-see booth at EXPO Chicago. Artwork included that of seminal artists Alex Katz and Jim Dine, as well as the infamous surrealist Rene Magritte. Richard Gray Gallery also featured local and historically important artist Theaster Gates. As their collection proved to already attract crowds, the sculpture Laura Asia in White by Jaume Plensa became a star of the EXPO, as so many could not keep their eyes off of the optical-illusion created in the clever perspective of the piece. Installation view of BEERS London booth at EXPO Chicago, 2018. BEERS Gallery completely transformed their booth into a dynamic and colorful installation that covered every inch of the space with graphic shapes. Instead of a white cube, this booth immersed the viewers in an abstract world created by St. Louis-based artist William Lachance. The installation featured elements that came off of the wall, such as basketball goal, with accompanying basketballs on either side of the gallery (painted to match the walls, of course.) This being their first time at EXPO Chicago, BEERS Gallery certainly left their mark.